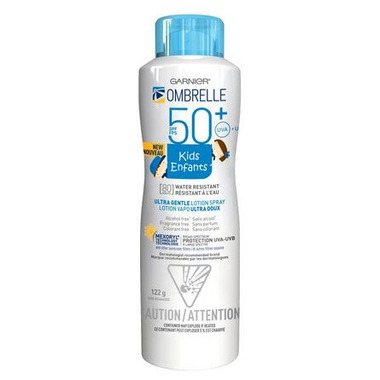 Garnier Ombrelle Kids [80 minutes water resistance] Ultra Gentle Lotion Spray SPF 50+ is a broad spectrum sunscreen specifically formulated for a child's sensitive skin. The formula goes on white, ensuring no spots are missed. It's lightweight texture is non-sticky and fast-absorbing. Also, sand does not appear to stick on skin after use. This spray is alcohol, fragrance, and colorant free. Ombrelle Kids Ultra Gentle Spray is a broad-spectrum and moisturizing sun protection lotion specifically formulated for the child’s delicate skin. An SPF of 50+ ensures high protection. This lotion spray contains Mexoryl technology, providing broad-spectrum UVA-UVB protection and 80 minutes of water resistence. The lotion spray goes on white, making it convenient to apply and ensuring ease of coverage. This lotion spray is alcohol free, colorant free, and fragrance free. Directions: Shake well before use. Spray generously and spread evenly be hand 15 minutes before sun exposure. Reapply at least every 2 hours, after 80 minutes of swimming or sweating and immediately after towel drying. Hold container 10 to 15 cm from skin to apply. Do not spray directly onto the face. Spray on hands and apply to face. Do not apply in windy conditions. Use in a well-ventilated area. Avoid inhaling or exposing others to spray. For use on children less than 6 months of age, consult a health care practicioner. May be necessary to clean nozzle.